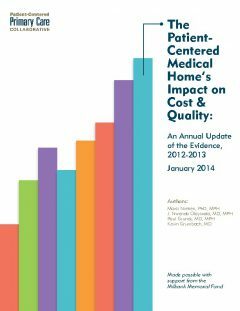 This annual report by the Patient-Centered Primary Care Collaborative with support from the Milbank Memorial Fund highlights recently published clinical, quality, and financial outcomes of patient-centered medical home (PCMH) initiatives from across the United States. Profiling a showcase of PCMH initiatives, the report focuses on studies released between August 2012 and December 2013 and identifies where they are happening, who is leading them, and highlights the outcomes they are achieving. Although the evidence is early from an academic perspective, and this report does not represent a formal peer-reviewed meta-analysis of the literature, the expanding body of research provided here suggests that when fully transformed primary care practices have embraced the PCMH model of care, we find a number of consistent, positive outcomes.